On the unforgettable show, Lord Grantham's heir, James Crawley, and his son Patrick perish. Lady Mary was to marry Patrick. She grieves, briefly, as you might recall, then has her eyes on another suitor, and a new heir presumptive soon arrives. In Schenectady in April 1912, Frederick Freeman (F.F.) Proctor had tickets on the Titanic with his wife, Georgina, along with their friends, well-known New York City producer Mr. Henry Harris and his wife, Irene. They were on a month-long vacation to Europe. Shortly before leaving on this holiday, Proctor had purchased a theatre at the corner of State and Erie Boulevard in Schenectady – a different and earlier location, it preceded the opening of the current theater we all know further down State Street by 14 years. At that time, the site was almost ready to be opened by another party when Proctor bought the property and had his own crew go in and finish the business which would be his first theatre in Schenectady. About two weeks into their trip, the theater manager called Proctor to let him know that if he wanted to be at the grand opening of his theater, he would have to come back early. So, despite having tickets on the Titanic, the Proctors took another ship home and did attend the grand opening of that theater in April 1912. Their friends, Mr. and Mrs. Harris, however, endured the tragedies of the Titanic. Mr. Harris’ body was never recovered. Marilyn Sassi, who is on the Proctors historic committee and runs public tours at the theater, said she had heard that Mrs. Harris made it and was one of the last to be pulled out from the water into a rescue boat. “The opening of the theater likely saved his life,” said Sassi of F.F. Proctor. Born in Maine, Proctor was discovered at a young age to be agile on gym equipment. He became a circus performer, doing acrobatics, juggling and tightrope walking. He later became a vaudevillian and owned or leased about 53 theaters – the first one was opened around 1870 on Green Street in Albany when he was about 20 years old. 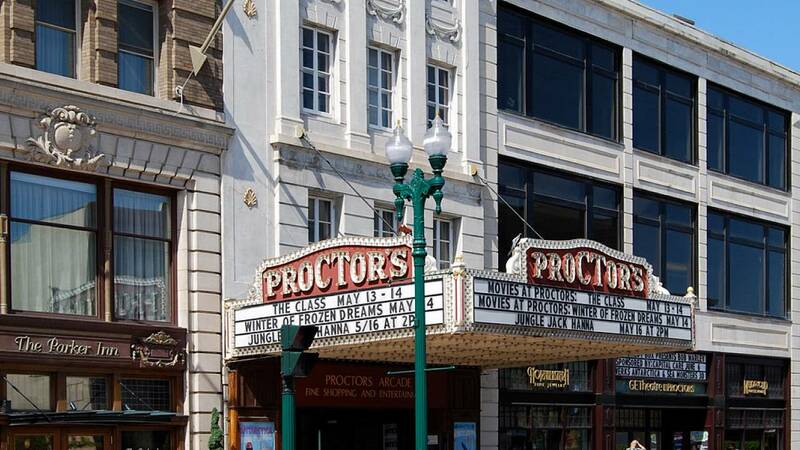 The “jewel in the crown” of this theatrical empire was Schenectady’s Proctors which opened December 27, 1926, said Michael Eck, who helped put together a coffee table-style book called “Proctors at 90.” The book came out December 7, 2016. The theater opened with a showing of silent film Stranded in Paris, according to an original program from the grand opening of Proctors that was found. Proctor, who also produced his own vaudevillian shows, died in 1929 – just three years after the Schenectady theater we all know and enjoy opened. “He really did live a charmed life,” Sassi observed. You can learn more about Proctors and the book here. Catch up on the whole series (and get ready for the upcoming Downton Abbey film) by watching Sundays at 3pm on WMHT and online anytime with WMHT Passport.